Hi, I’m Steve. I’m a writer by day and a wild man by night. Actually, that’s not quite true. I am a writer by day, but I tend to be a sleeper by night. I think I’ve behaved in a way that qualified me as “a wild man by night” exactly once. I woke up on the floor the next morning with my head in a trash can and a hangover that lasted a week, so I never felt the need to get “wild” like that again. But as personal mottos go, “I’m a [fill in the blank] by day and a wild man by night” ain’t bad. As long as you can live up to it and you don’t mind the hangovers and trash cans, I mean. I’m not sure if the guy who came up with the phrase was a true wild man or not, but I’m willing to give him the benefit of the doubt. Why? Well, just check out his shirt. I’m pretty sure he doesn’t start buttoning it until somewhere south of his navel. You can see him here, 19 seconds into a compilation of highlights from 1980s dating service tapes: Watch, if you dare. Even if you don’t dare, plenty of other people have. That video’s been viewed on YouTube 4.8 million times. It’s inspired a lot of laughter—and one piece of short fiction (that I know of). 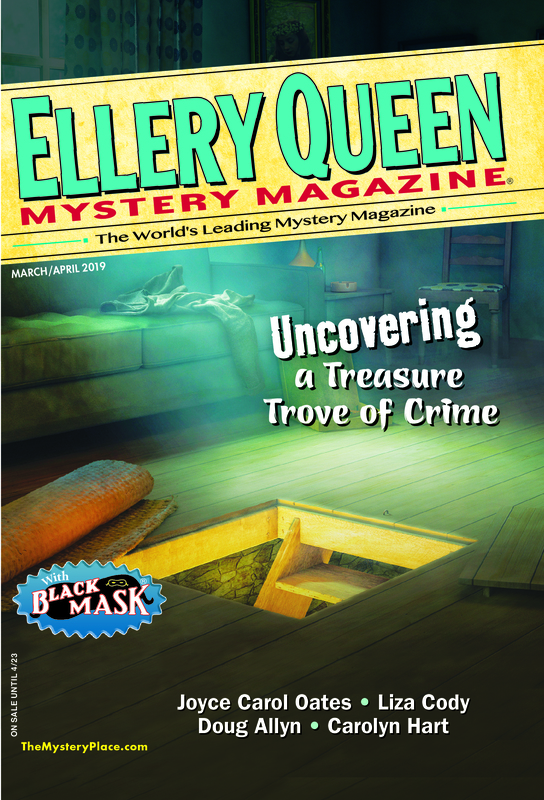 My story “Where the Strange Ones Go” appears in EQMM’s May/June issue. I wrote it to challenge myself. I’d just written another short story in which the plot was advanced almost entirely through emails. (That story, “i,” appeared in AHMM last fall.) I wanted to try again to see if I could tell a story through excerpts from some other medium. But what? I don’t remember how I hit upon the idea of dating videos as the backbone for a crime story. (Hey, cut me some slack—this was, like, a year and a half ago!) But I knew the compilation reel on YouTube well, having chuckled at it several times over the years. So I watched it again. I found a lot of fodder for humor, of course, as well as an idea for a plot. But I found something else, too. Something I wasn’t expecting. I found a heart for the story. It’s easy to laugh at Maurice, the video’s “executive by day, wild man by night.” Ditto the other wild men who recorded video profiles as part of their quest for Miss Right. A couple of them seem like real jerks. (I’m looking at you, “No fatties” dudes.) But watching the video again as a happily married man creeping up on fifty, I found less to laugh about and more to feel. I gave myself permission to be amusing, but not mean. “Mean” I would leave to the bad guys in the story. Which isn’t a bad way of looking at characterization in genre fiction in general, I think. Have fun. Entertain. Give your characters foibles and flaws. But don’t forget that they have souls, too. This entry was posted in Characters, Fiction, Guest, Story, Writers, Writing and tagged 80s, 90s, characterization, characters, mystery fiction, steve hockensmith, writers, writing. Bookmark the permalink. Thanks, John — hope you dig the story, too!